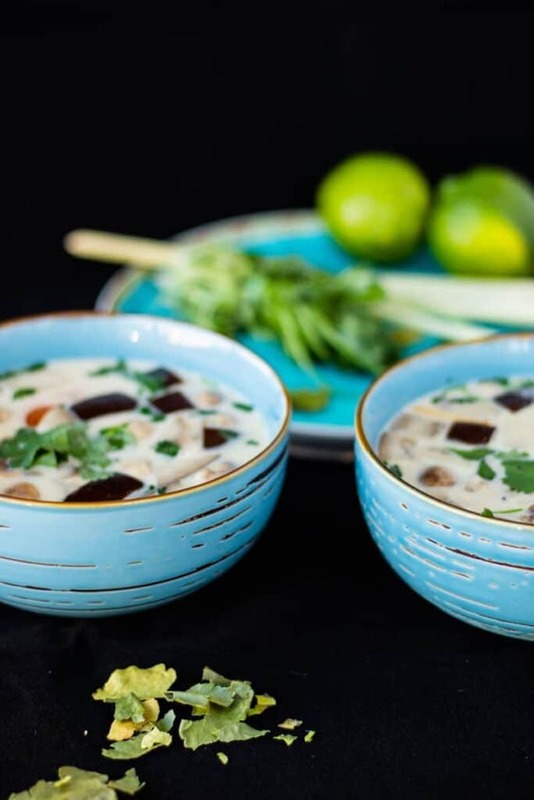 This quick & easy Thai Ginger Coconut Soup is almost vegan and perfectly warm and cosy for the winter months. 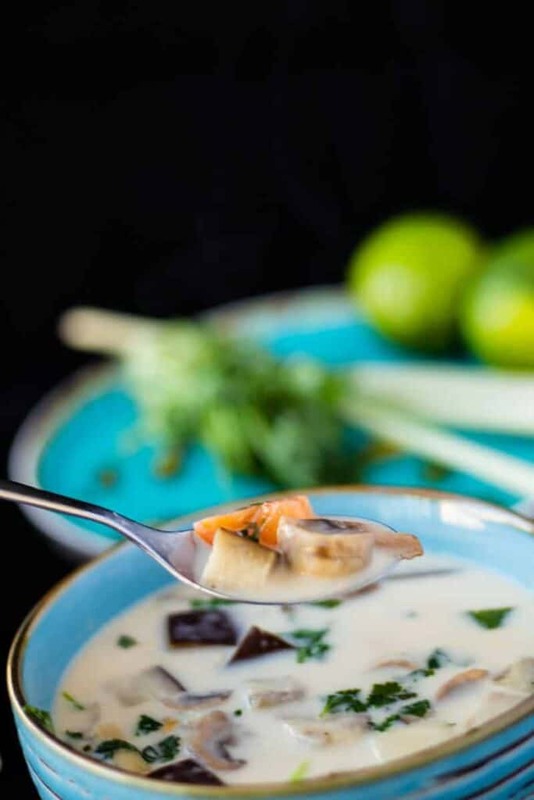 Based on a classic Tom Kha recipe, this one uses ginger in place of galangal and the end result is equally comforting. Every spoonful tastes like a hug, with subtle flavors all complementing the natural sweetness of the coconut milk. 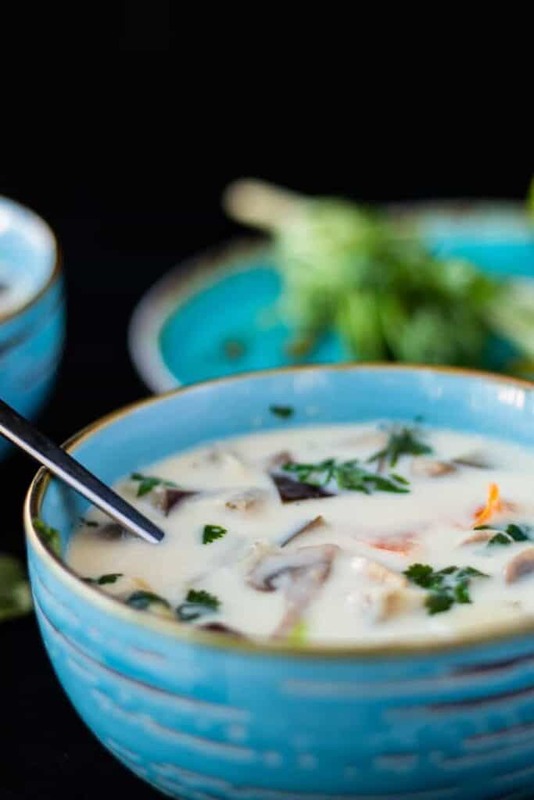 You might be familiar with the classic Thai dish Tom Kha Gai, which translates to Galangal Soup with Chicken. Traditionally served in Thailand during the cold winters (ehm, have they heard of Sweden??) the galangal is supposed to warm you up from the inside. Kinda perfect for a cold January, right? Well, the only drawback to galangal is that it’s generally quite hard to find in the west. Regular supermarkets often don’t carry it, and half of the time I even fail to find it at my go-to Asian supermarket. So since I’m all about recipes you can actually create at home – something had to be done! Enter: ginger. Another delicious root, closely related to galangal, but a bit different in taste, and even more fragrant. Galangal and ginger can look very similar, and some of you might even have mistaken them for one another at times. They are actually related, but not too close in taste. While galangal is more citrusy and nutty, ginger is more fragrant and spicy. 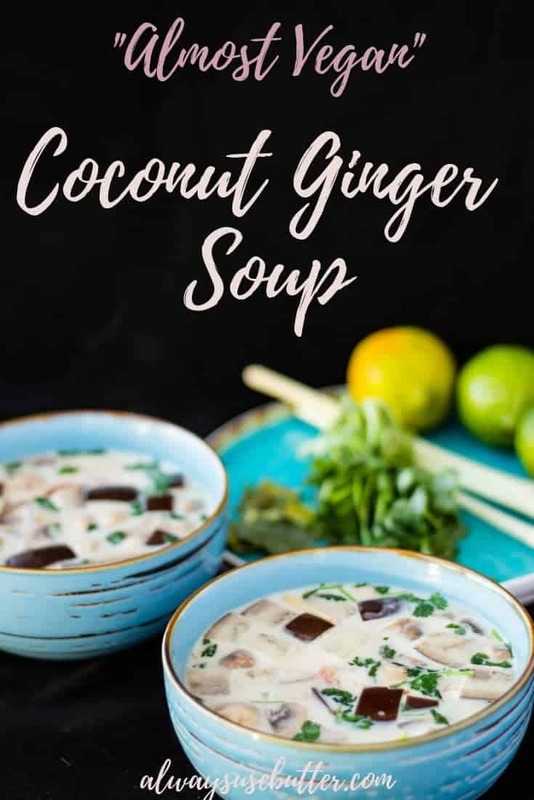 So when we use ginger instead of galangal we get a soup that has a bit of a bite to it – but not too much – and that longs for a touch of lime juice. Both galangal and ginger have amazing health benefits, and I find them both to be the perfect companions for cold & flu season. While they’re both highly anti-inflammatory and can help with digestive issues, galangal has in recent years been talked about as supposedly being amazing for fighting cancer and ginger can work wonders for all types of nausea – be it due to morning sickness, motion sickness or just a few too many glasses of vino. 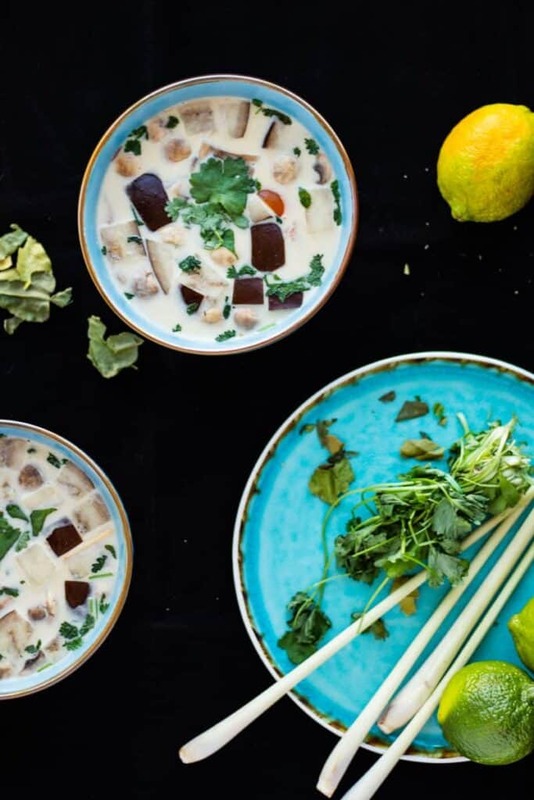 Making this ginger coconut soup is super easy and done in just 20 minutes. No meat, no poultry, no fish – however, there is a dash or two of fish sauce in there, making it neither Vegan nor Vegetarian. But if you’re just trying to cut down on the meat, then this might just be sufficient for you. I know it is for me! To get started, chop up your eggplant, tomatoes and white button mushrooms. Then heat up the vegetable stock, coconut milk and coconut cream. Now what is coconut cream, you might ask. Coconut cream is basically a fattier version of coconut milk, but the difference in fattiness isn’t too big in the west. The coconut milk I used for this recipe contained 17% of fat, while the coconut cream had 20%. So if you can’t find coconut cream – just add the same amount of coconut milk instead. Fun fact about coconut milk and cream: in Thailand I was taught that what we get here as Coconut Milk is often what they call Coconut Cream, while their version of Coconut Milk is often called “Light” Coconut Milk in the west. And the difference in fattiness really comes from the coconut cream coming from the first pressing of the coconut, and the coconut milk from the second. A little trivia for you to serve with this dish! Anyway. When you’ve heated up the vegetable stock, coconut milk & cream to a boil you add in the ginger, kaffir lime leaves and lemon grass. Now, two important pointers here regarding kaffir lime leaves and lemon grass. If you manage to get ahold of fresh kaffir lime leaves, wait and add them at the end instead – at the same time as the chili. I’ve never seen fresh lime leaves of any kind in Sweden and so I use the dried kind. These need a little time to release all their flavor and hence I add them earlier. Now for lemon grass to release all that delicious flavor, you do need to manage it a bit. Nothing difficult, but if you don’t you just won’t get the same amount of flavor. What you do is you cut the lemon grass into a few pieces, and then crush the pieces using the side of your knife. It should still stick together (so you can easily remove it at the end) but crushing it releases all that yummy flavor. OK so when you’ve added the ginger, lemon grass and lime leaves you stir and let it boil for about 2 minutes. After this you add in the chopped egg plant, tomatoes and mushrooms, stir, and let boil for another 5 minutes before taking off the heat. Add in the chili (without the seeds, if you don’t want too much heat), stir, and let sit off the heat for 2 minutes. After this comes the part that will make your soup fancier than all the other Thai soups: the removing of all the stuff you don’t really want to eat. This might seem tedious and yes I know they don’t always do it for Thai takeout – but we’re trying to be better than that, OK? It’s really not too much work. 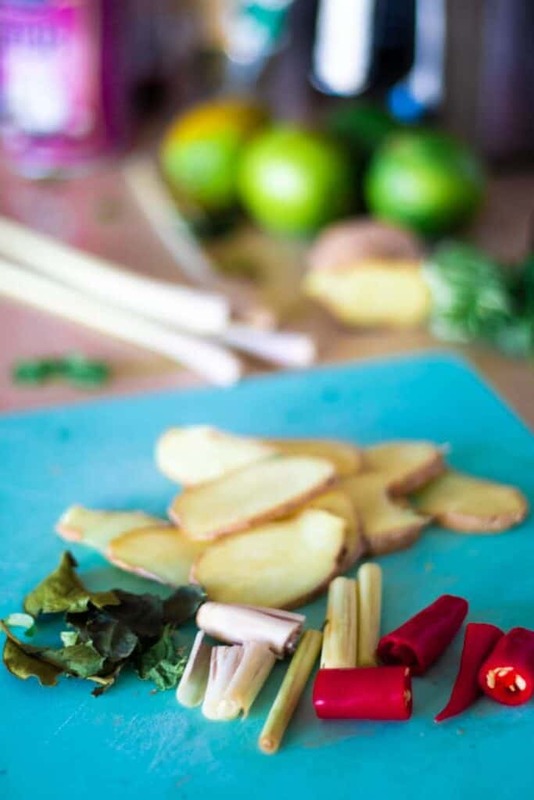 Just grab a pair of kitchen forceps and pick out the ginger slices, lemon grass pieces, lime leaves and chili. Now comes the final touch! Season with fish sauce and lime juice, according to your taste. I really like this soup not to have too overbearing tastes, but to be more soft and comforting, so the amounts stated in the recipe should accomplish just that. If you want more or less flavor – just adjust, taste test, and add as needed. Finally, mix in the chopped cilantro, and serve. Whew! That was a long one. 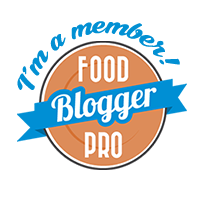 The actual making of ginger coconut soup is not at all as complicated as this post is long, and I am confident you will pull it off without a glitch. 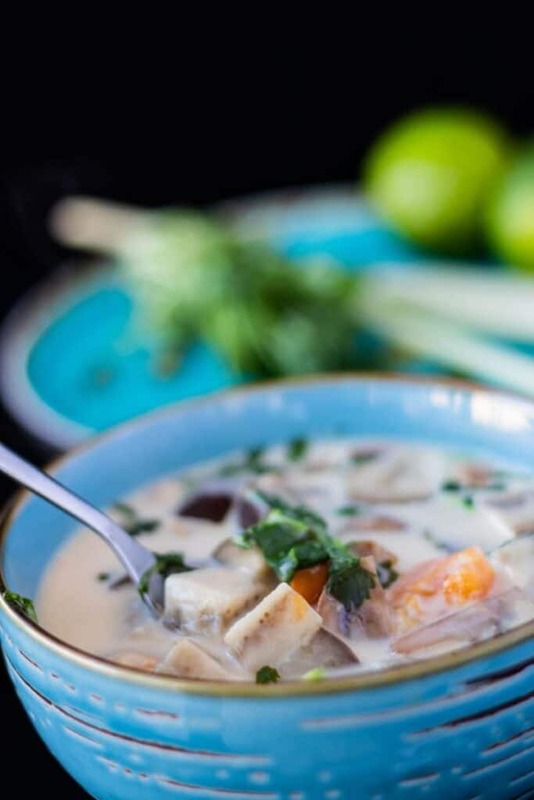 If you just can’t get enough of Thai Soups – check out this Thai Chicken Noodle Soup as well. Did you try this recipe? What did you think? Please leave a comment and a rating below, and let me know! Or just leave one anyway – I love hearing from you. Posting about this anywhere? Please tag me @alwaysusebutter and use the hashtag #alwaysusebutter. Now enjoy this cosy meal in the cold weather, and let’s talk in a few days. 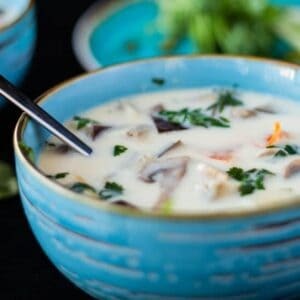 Pour the coconut milk, coconut cream and vegetable stock in a large pot and stir. Heat to a boil over medium heat. Add in the ginger, lemon grass and lime leaves. Stir and simmer for about 2 minutes, until fragrant. Add in the chopped egg plant, mushrooms and tomatoes. Stir and bring back to a boil. Simmer for about 5 minutes, until vegetables have softened. Take the pot off the heat and add in the chili. Stir and let sit for 2 minutes. Meanwhile, use a kitchen forceps to remove the slices of ginger, pieces of lemon grass and lime leave. Finally, remove the pieces of chili. Add in the fish sauce and lime juice. Taste test and adjust. Finish by adding in the chopped cilantro. Serve on its own, or add cooked jasmine rice for a larger meal. Like it hot? Keep the seeds in the chilis when adding them. Make it vegan? Exclude the fish sauce or replace it with your favorite substitute. Wow, this looks amazing. I think the only thing that would stop me from trying to make it is the fact that some of the ingredients is harder to find. I wish all grocery stores would carry more health foods and get rid of all that junk they sell. Thanks for sharing this recipe. Looks yummy! Definitely going to give this recipe a try. Looks so good! Thank you so much Elysha! This looks absolutely delicious! And so true that the west is often afraid of fat. Such a shame since there are many good fats that we need in our diet! And coconuts are an excellent source of good fats! Thank you, Reese! Yes I totally agree. I remember not too many years ago when everyone was eating Low fat yoghurts with loads of sugar in them thinking it would make them skinny! So glad that is starting to change. There are not too many Thai dishes I don’t like. Most of them are so tasty and with the ingredients they use, it is generally extremely healthy for you also. This soup dish looks fabulous and very much the same. I will look forward to giving this a go for sure. Thank you so much, Nicole! 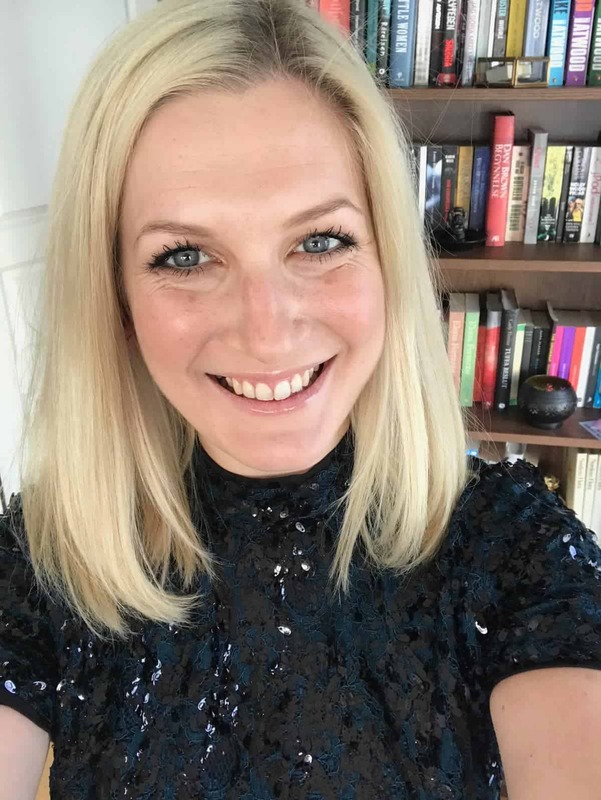 I’m the same – give me anything Thai and I am one happy girl! Once you have all the basics at home it’s also so easy & cheapto make! I would like to make this soup sometimes, it sounds delicious. I have recently discovered the flavour of lemongrass and since I bought some dried ones (I can’t find fresh in my country), the Asian meals that I cook taste so much better. Ah never tried dried lemongrass but I’m sure it works wonders as well! Such lovely flavors. I Sweden I find my fresh ones in Asian supermarkets, maybe there are those kinds of stores in your country as well? You had me at Thai! 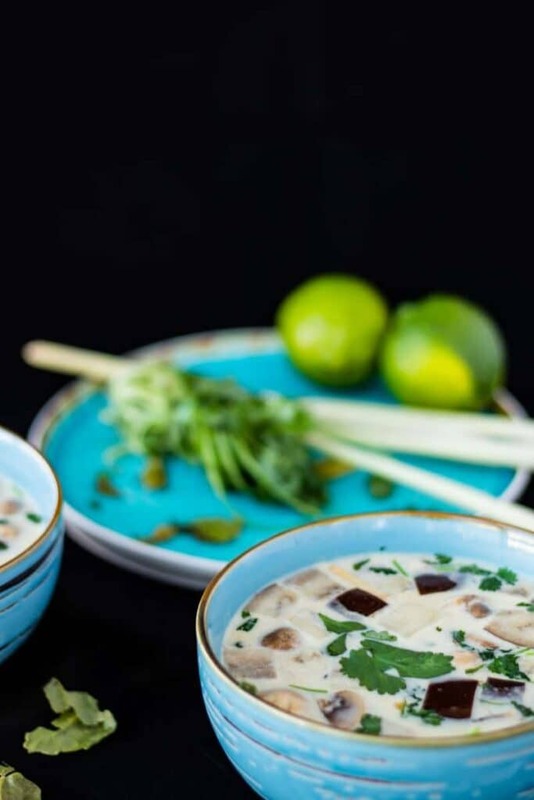 I love the flavors of Thailand and soups are such a great way to enjoy the flavor. Same here, Bree!! Thanks for commenting! I have never tried to make this kind of dish and this soup recipe of yours looks really delicious. I will definitely try to make this for the whole family! Thank you, Catherine! Hope you like it! Wow, this looks so delicious! I love all of these flavors. Thai food is one of my faves. Wow, I love this soup recipe it is so delicious and look so easy to prepare. I will def try to make this for the whole family. This looks amazing. This soup dish looks fabulous. As a vegetarian I always look for vegetables recipes. Thanks for sharing this one. Perfect recipe for good health. I will give these a trial. This sounds delicious! I love Tom Yum soup too so I’ll be trying this. Omg can we say yum?!? I just love soup! Must give this recipe a try. Yum! Haha thank you! Hope you try it! This looks really delicious! I love finding out about all the different types of soup flavours that are possible to make and pull off. Thank you for sharing!